Thomas Tallis’s 40-voice motet Spem in alium is widely considered to be the pinnacle of the large-scale renaissance polychoral style. 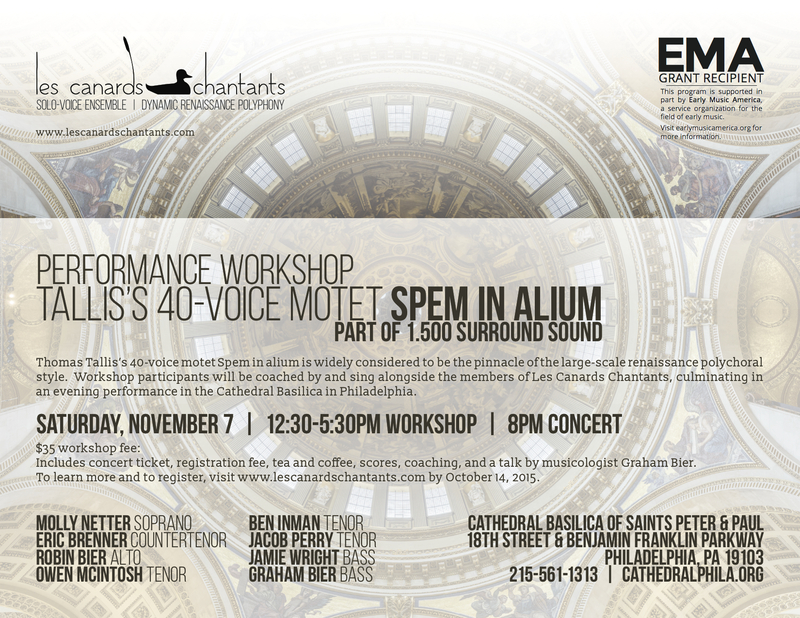 As part of our new polychoral program 1.500 Surround Sound, we are offering exceptional singers in the Philadelphia area the opportunity to explore and perform this astonishing piece of music with us, in the gorgeous acoustic of the Cathedral Basilica in Philadelphia, Pennsylvania’s largest cathedral. Workshop participants will sing alongside and be coached by the members of Les Canards Chantants in tutti sessions and sectionals, working from a new edition of the score which represents the most recent scholarship. The workshop will also include a talk on the history of the piece by musicologist Graham Bier, and will culminate in an evening performance in the Basilica as the finale of 1.500 Surround Sound. Singers can expect to perform 2-3 per part; . Prior experience with consort singing or renaissance polyphony is desirable but not required; choral experience and some classical vocal training is expected. Singers do not need to possess an “early music sound”, and will not be asked to sing off the voice or with a straight or restricted tone. Les Canards Chantants subscribes to a fully engaged, healthy and flexible vocal production, in which blend is achieved through attention to tuning, unified vowels and phrasing. Priority will be given to students pursuing a degree in music. Accepted participants will be notified as soon as possible after the application deadline. Scores and part assignments will be provided to all participants no later than Saturday, October 17. Registration fee will be collected upon arrival on November 7.